The harder Apple tries to make us keep signing up for .Mac, the less inclined we feel to join them. Until now, though, alternatives were hard to come by. You could cobble something together from various services, but the main missing link was always iDisk. You might get some free or paid-for online storage, but you generally had to access it by uploading/downloading using a web interface or with a clunky FTP client; there was no desktop-integrated volume. A solution of sorts has just been launched by Mac-only ISP MacAce.net. Dubbed MacMate, it offers a volume that mounts like an iDisk on your Mac, enabling you to open files from it and save them to it as you would with any local volume. The MacMate service also include 25MB of space for email - accessible from a client such as Mail via POP or IMAP, or from a webmail service - and the promise of services to come. It's available in three sizes. Lite (with 1GB of storage and 15GB bandwidth) is £39 per year, Pro (10GB with 100GB bandwidth) is £59 and Elite (25GB with 250GB bandwidth) will cost £99 annually. 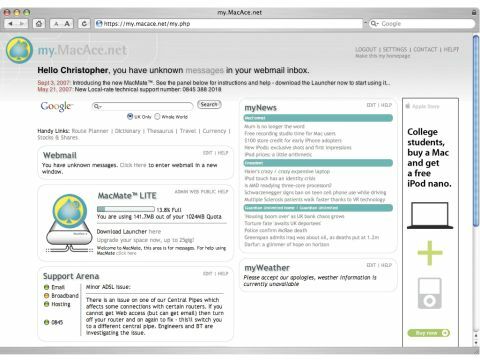 The best news is that the Lite service is included with MacAce.net's 8MB broadband packages. These range from £20 per month with a 5GB cap up to £40 per month for the uncapped service; while these prices are being undercut by many, the inclusion of MacMate does add value, and remember that MacAce.net will offer technical support tailored to Mac users. Initial impressions are a little spoiled by the styling of the pages and icons. Next to the polished .Mac site, my.macace.net does look a little shoddy. The important thing, though, is the performance, and here we were very impressed. Our testing consistently showed that we were getting upload speeds that were four times as fast as iDisk. This is particularly impressive given that MacMate - like iDisk, a WebDAV drive - is being accessed securely, a process that adds overheads to the transfer. With these speeds, we began to use MacMate almost as we would a local volume, saving files to it directly from dialog boxes. Saving files directly in this way isn't going to be practical for anything other than word processing files and snaps from consumer digital cameras, but it's certainly more usable than the iDisk. There are folders similar to the Sites and Public folder with iDisk. Put sites into the Web folder and you're given a URL for viewing these pages. It's in the slightly ungainly form of http://macmate.macace.net/ username@macace.net but you can opt to buy a .me.uk domain instead. Public files are accessible at http://macmate.macace.net/ username@macace.net/public/, but others can't upload to that directory. MacAce.net plans to provide a Secure folder that will be encrypted. But it's not quite as tightly integrated into the Mac experience. The MacMate drive has to be manually mounted before using most consumer backup applications, though this could be automated with AppleScript. Still, email is rich - the inclusion of IMAP access is a boon, particularly if you work from more than one computer - but setup is tricky, and it forces the inclusion of special folders for Sent and Trash that can't, with Mail, be tied to client-specific equivalents. Setting up in general can be tricky; at the time of writing, the help files were general, and the email set-up sheets were outdated and made no reference to IMAP. MacAce.net, is working hard to rectify this. Ultimately, the Pro plan - with its 10GB capacity the most directly comparable with .Mac - is only £10 cheaper than .Mac and you don't get the same integration with OS X or, at present, a way to sync PIM data between multiple Macs. Nor do you get the Backup app that comes with .Mac, or the galleries published from iPhoto or iMovie. That said, the speed boost is terrific, and as a value-add to MacAce.net's broadband plans, the Lite plan is inspired. With further developments already on the horizon, we look forward to seeing the service grow into a credible .Mac competitor.